Interesting sighting by Val Leaver, Ivy Cottage, at the bottom of Black Lane. Well spotted Val. 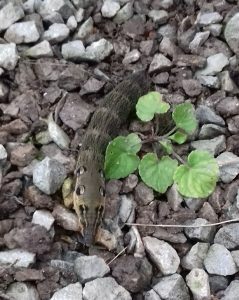 “Spotted this in the garden the other day (outside the back door) so thought it was worth a mention as a different sort of wildlife on Black Lane. 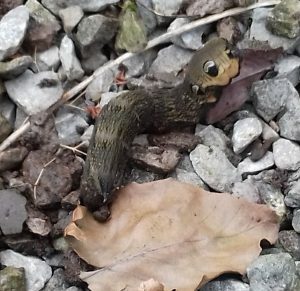 Elephant Hawkmoth Caterpillar – 2 photos just to prove it is alive! The caterpillar turns into a chrysalis and then emerges as a beautiful moth – see photo below. 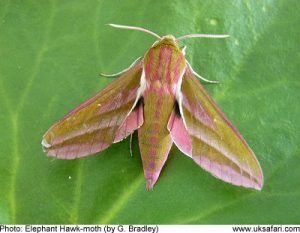 Special features: Large Elephant hawk-moths are one of the most brightly coloured moths found in the UK. Often reported as a “pink butterfly”.